Peway Ngo moved from Vietnam with his family to Winnipeg when he was a child. When he was seven he was in a car accident and consequently lost part of his leg. He was then also a hearing impaired child struggling to learn both English and American Sign Language (ASL). 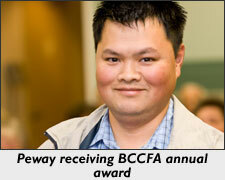 Through the years, Peway has learned that manual dexterity - or working with his hands-is one of his chief strengths. Coupled with his creative interests, he has explored occupations involving computers and automotive design. With employment barriers involving hearing impairment, language barriers and mobility restrictions, however, Peway has struggled to find sustainable job opportunities. Peway knows firsthand the difficulty employers face when considering accommodating a deaf worker. As Peway explains: "Being deaf, people don't want to hire you because they don't know how to communicate. Training can take longer sometimes. It's a lot of work to educate people." Still, Peway is highly motivated to support his wife and young daughter and his substantial work history reflects this determination. Peway has accessed the assistance of employment support services from community case managers and as a result has established a wage subsidy through the Opportunities Fund. Support from the Opportunities Fund has included purchase of adaptive equipment for Peway's workplace in addition to interpretive services for specific job training. Peway's employer, Draken Enterprises, provides specialized auto treatment services to the TV and film industry. Peway appreciates his varied job duties with Draken and describes his employer as both "open-minded and considerate" in relation to his disabilities. Once his job training is completed, Peway will have a highly specialized skill set that will afford him greater job opportunities. Peway is thankful that the Opportunities Fund afforded him the chance to work in the (autobody) field that he loves. Copyright © 2017, BC Centre for Ability. All rights reserved.